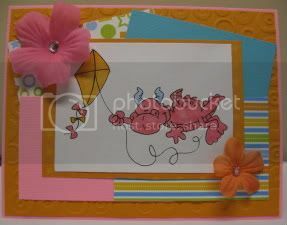 I used the sketch from Spoonful of Sugar this week along with the color combo from SPCC Color Combo which was melon mambo, only orange and bermuda bay. I don't have the SU colors so I used these colors which I thought were pretty close. This is a Dustin Pike image which I colored with my Copics. I decided that I need more Copics (of course!). This card is so cute! Thanks for joining us at SPCC. Adorable and great use of this weeks color combo. Hi Lori, thank you for the comment on my blog! This card is totally adorable. Those colours are super close. You did an amazing job with the colour combo. I love that dragon and the circle embossing on the orange background paper. Love that little dragon! Such a cute card! Great job! It's adorable! Love the lil dragon. Exccellent job with the colors!! Perfect!! And the coloring with the Copics, awesome!! Glad you could join us this week at SPCC!! OMG this just too cute!! OMG Lori, that is so stinkin cute!